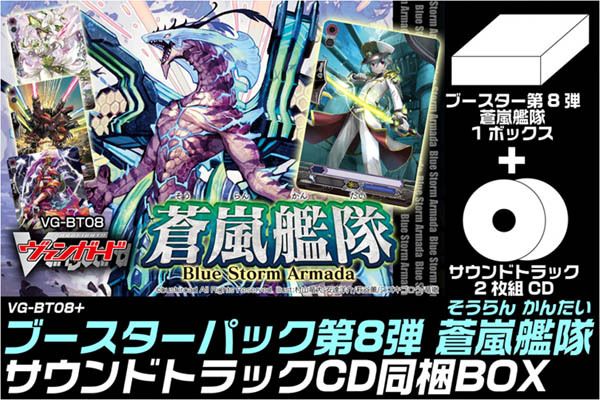 Through their Japanese twitter feed, Bushiroad has announced that first print boxes of Booster Set 8: Blue Storm Armada will come packaged with two OST disks, containing the soundtrack BGM of Cardfight!! Vanguard's first and second seasons. The release date for the special edition is given as September 22, 2012. While the soundtrack has been highly requested, and partially reconstructed by amateur artists like AkioScenro, until now Bushiroad was hesitant to release an Original SoundTrack due to the perceived low sales of BGM CDs. In other news, the respective dub voice actors of Kai and Morikawa, Ryan Luhning and Lucas Gilbertson, will be attending Anime Expo 2012 as special guests of Bushiroad. Luhning has been heavily criticized for his portrayal of Kai, which has been perceived as deviating significantly from the source material. Gilbertson, while not highly praised for the part, has not faced any similar criticism due to his character's relatively minor role in the series. Update: The special release of BT08 will be sold separately from the standard BT08. The soundtrack will include all BGM used from rides 1-65, and will cost 3000 yen(about $38) more than the box's regular release.